The Notepad replacement Notepad++ is storing sessions by default. This means that a user opening a supported document in Notepad++ is also seeing the documents of the last sessions in the tabs on top. This feature can be handy if a user works with the same documents most of the time; It can on the other hand be a privacy risk and some users might want to turn of sessions in Notepad++ to eliminate the risk. Disabling sessions from Notepad++ should not have any impact on other software features like the tabbed interface. The option to disable sessions in Notepad++ can be found in the options of the software program. 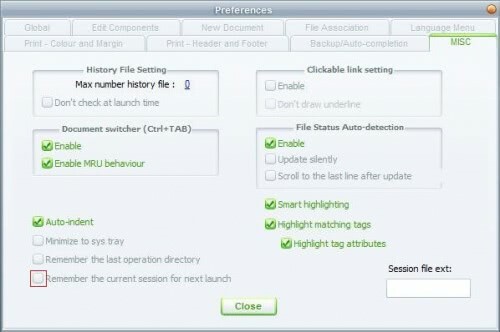 A user opening Notepad++ can open the program's options by selecting Settings from the main menu and Preferences from the submenu. The Preferences window is opening which is displaying several tabs and lots of options. Locate the Misc tab of the Preferences menu and uncheck the "Remember the current session for next launch" box to disable the session feature in Notepad++.The user will only see the current document the next time Notepad++ is opened. New documents are still added in tabs during a session but once Notepad++ gets closed the information are erased. Wooo-ooow, in the settings? Fascinating. The sarcasm is good, but I had already searched through the options and couldn’t find what the developers called the stupid option, until I found this tip with Google. Thanks Martin!